Worksheet Analysis for Excel adds over 100 time saving analysis, worksheet management and data manipulation features to Microsoft Excel. 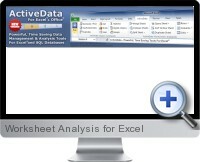 Worksheet Analysis for Excel is ideal for analyzing or manipulating corporate, accounting or financial data with Excel. Works with Excel 2000 and higher. Free fraud detection for Excel E-Book. Easy to use with simple interface built into Excel menu. Built right into Excel eliminating the need learn a new environment in order to realize the benefits quickly. Powerful analysis features such as group summaries, gap and duplicate detection, stratification and digital analysis using Benfords law.